Samsung has officially unveiled its 2018 range of QLED, Ultra HD and Premium Ultra HD TVs for Australia, and there’s plenty on offer for fans of mammoth screens. Along with Samsung’s flagship QLED range – the Q9F, Q8F, Q7F, and Q6F models – the company is also showing off a series of premium and standard UHD TVs in its NU8 and NU7 series. 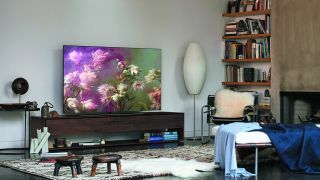 The range offers seven products that boast 75-inch or above displays, which Samsung claims is responding to the “rising demand amongst Australians for large-screen televisions”. Naturally, Samsung’s Quantum Dot technology is making a return, promising pure colours and rich, deep blacks across its Q-range of TVs. The company is so confident in its inorganic LEDs’ ability not to cause in burn-ins that it’s offering a 10-year guarantee against the issue. Newly introduced with the 2018 QLED range is the ambient mode. TVs with this feature can detect the colour and pattern of the wall they’re mounted on and, thanks to the burn-in avoidance, can display a static image and appear like a seamless extension of your wall. Samsung's Ambient Mode blends in with its surroundings. This ambient mode also displays information such as the time, weather and more across the back-drop, and can be set up to automatically turn on and off when someone enters or leaves the room. You’ll be able to pick up one of Samsung’s latest TVs from April 23, and you'll find a full list of the range’s RRPs below, although the Q6F series pricing is yet to be confirmed.